Funeral Procession arrives at Village View Cemetery. 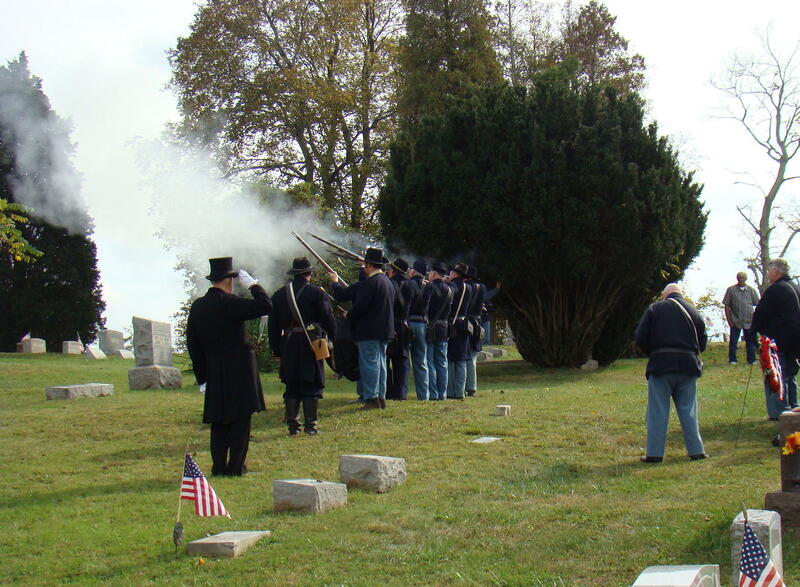 Village View Cemetery in Sarahsville, Ohio was the scene of the rededication of the remains of Pvt. Absalom (Abner) Robinson, Civil War veteran. 2013 was the 120th anniversary of Abner’s death and the 150th anniversary of President Lincoln’s well-known Gettysburg Address. Robinson brothers arrived ready to help at original burial site. 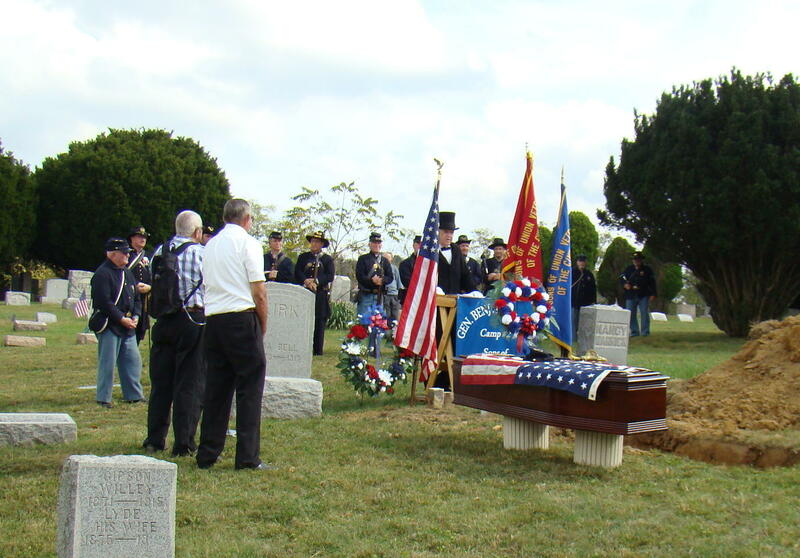 Actual preparation for the ceremony began earlier in the week when three great-great-grandsons of Pvt. Abner Robinson met on top a hill in East Union with township trustees and the local funeral home. They knew exactly where Abner Robinson had been buried as the tombstone was still on the hill. Seems that in 1893, Abner died after being struck in the eye by a rusty nail while helping with work on a barn. At that time they were not certain of the actual cause of death or what illness might be involved, so decided to bury Abner on top of a far away hill so he wouldn’t spread his possible disease, most likely tetanus, to anyone else. Knowing the story, the family decided they would like Abner Robinson’s remains to be moved to their family plot. After digging by the tombstone, they found no sign of any remains. But when one of the relatives suggesting digging closer to the cedar tree, they made some exciting discoveries. Not only did they find the original cedar casket, which was squashed to about eight inches, but inside they found several bones, part of the skull, and teeth. 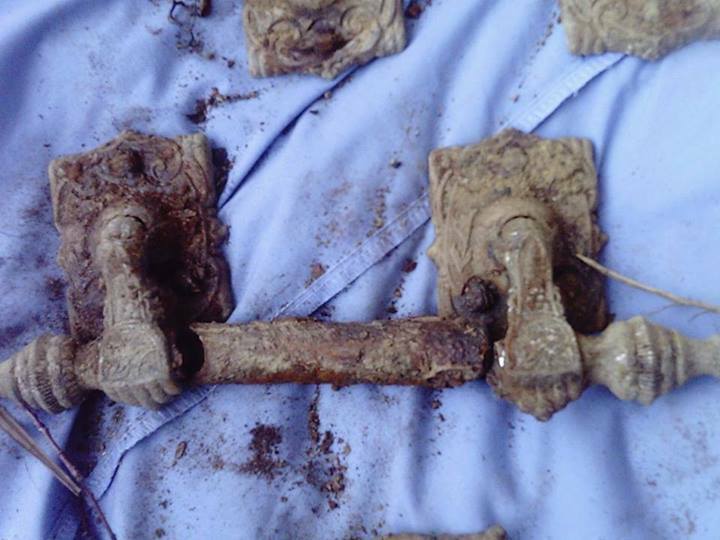 There were also hinges that still worked on the lid as well as other pieces of rusted metal. The local funeral home, McVay-Perkins of Caldwell, took those body parts found in the 1893 casket, and put them in a pouch to be placed inside the new casket, which was made of cherry wood. Two black Percheron horses prepare for the procession. 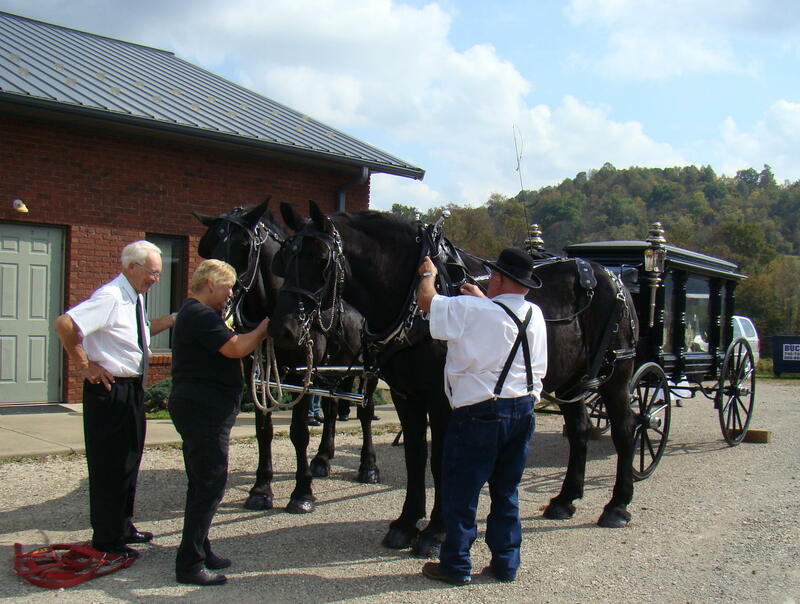 The funeral hearse drawn by twin black Percheron horses and provided by Robert Baird of Troy, Ohio, started their route at the Sarahsville Center Free Methodist Church. What a procession it was! Following the horse-drawn funeral carriage bearing Pvt. 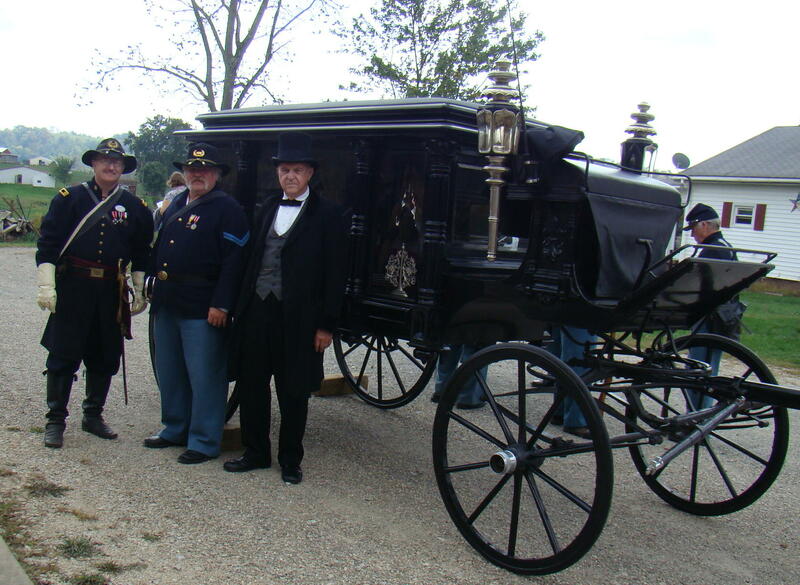 Robinson’s cherry casket, members of Sons of Union Veterans of the Civil War marched to the cadance of the fife and drum corps. Many descendents of Abner also walked the half mile road to Village View Cemetery in Sarahsville. Abner Robinson (1836-1893) served as a Private in Company G, 62nd Ohio Volunteer Infantry during the Civil war. Three of his brother, William, George, and John, were also members of the Union forces. Abner’s unit saw active service in places such as Shenandoah Valley, Peninsula Campaign, Beaufort, Morris Island and Fair Oaks. Governor Dennison rededicated Pvt. Robinson’s remains. A three round rifle salute ends the ceremony. The ceremony was brought to an end with a three round rifle salute by the color guard. A traditional fife rendition of Taps and a prayer concluded the events. Abner’s life must have been a difficult one from his Civil War battles to the farm in McCleary, Ohio (now East Union). When he died, the copy of Probate Court papers declared that his amount of personal property would be about $2.00 and his real estate about $15.00. Have to imagine that the rededication of his remains was more expensive than anything he could possibly have imagined. This ceremony held extra interest for this Gypsy since Pvt. Abner Robinson was the great-great-grandfather of my cousin’s husband, Jerry Robinson. Jerry is one of those pictured at the original grave site and helped with discovering the remains.